Have you ever gotten into a book so much that you tell yourself, "okay, I'm stopping at the end of this chapter" and then completely NOT noticed that you had gotten to the end of the chapter and just kept on reading? That was this book for me. 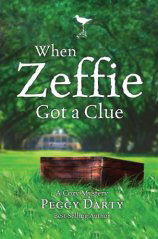 When Zeffie Got a Clue is called a "cozy mystery" written by Peggy Darty. It might have helped me a little bit if I had figured out that this was the third in a series, but it didn't affect the story at all. It might have been useful to know that Christy had recently solved 2 other mysteries in her town (previous books). However, the author successfully wove bits of the story together to keep you in suspense the entire time, yet give you hints that had you guessing which of the characters was the murderer. This was a pretty quick read for me and not overly "preachy". I guessed wrong on the murderer! My only critique is that there were too many characters to keep track of and the story was pretty long for only taking place over the course of a couple weeks. Otherwise it was a fun book considering I don't usually go for murder mysteries! If you would like to win this book please leave a comment (and make sure I have a way to contact you!). Winner will be chosen Monday morning whenever I get up and am sufficiently recovered from my vacation! you are so funny! I try no to read many books anymore because of that very problem, most of the time I devour the novel in about a day (300-500ish pages)when I go to kristens house I snag one and take it home only to read it the next day and then have it collect dust untill I can drive all the way to see her, to save on postage obviously!! he he he. every now and then I get to the lybrary but its important I do it quickly otherwise I end up taking the entire childrens section home. you have to take into account that without supervision my three have pulled everything off the shelves and the energy to admit it to the staff or re-shelve it my self has escaped me ;) I am impressed that you take time to blog on vacation...then again it IS addicting! I enjoy mysteries and this sounds like a fun read. Please enter me in your drawing. Thanks! Wow, it's been ages since I read a book in one sitting. This sounds like a good read. Oh, while I'm here please enter me in the drawing.